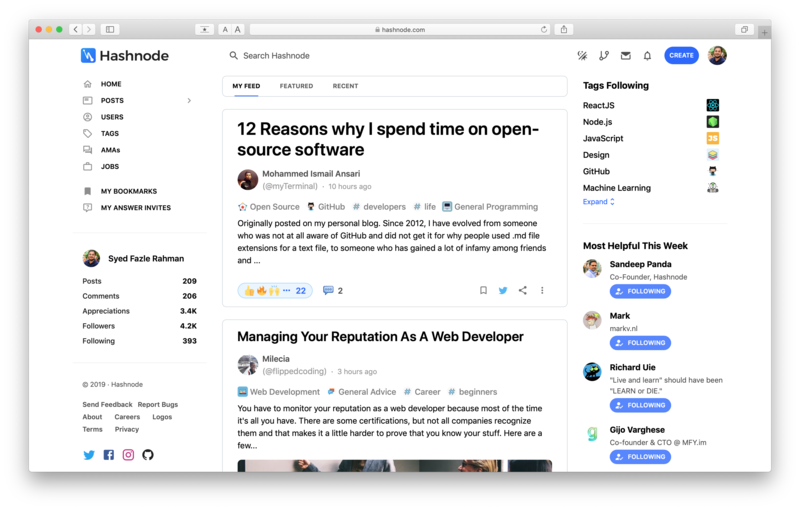 Say Hi 👋 to Hashnode's "Design Refresh"! If you have recently visited Hashnode.dev , you might have expected this change is coming to Hashnode.com very soon. When we announced the alpha release of Hashnode.dev two weeks back, many users loved the clean interface and its ease of use. We liked those changes too, and we were eager to bring that design language to Hashnode.com. We started by making the background white (#FFFFFF), to make the whole website look bright and fresh. We reduced the width of the website from 1400px to 1270px. It helped in reducing the stress on eyes and mouse movement between various sections. Fewer boxes or cards. Components present on the right column and left columns do not have borders anymore. Instead, we used more spaces to make them look different. As per our new design rules, only the cards in the feed will have boxes to grab user attention. Better post cards: we got rid of unnecessary negative spaces to create uniformity inside post cards. The tags have a logo beside them, and the post brief is back. Many users complained that they have to load the post to read more about it. With post brief, you won't have that problem now. Also, post cards will now help you easily differentiate between questions, stories, and AMA with the help of big and bold labels. Post cards without labels are stories. The all-new Beautiful Story Canvas: The new story pages are full width and clean. They have no sidebars or prompts. 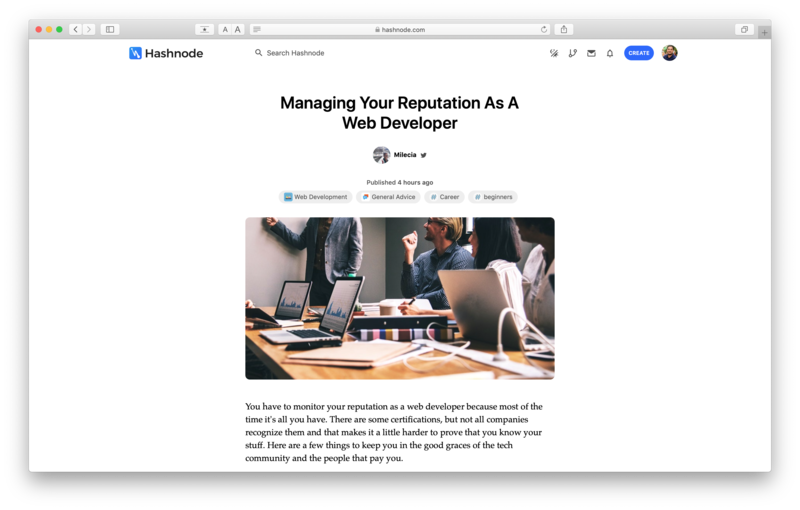 Your rich posts with code snippets, embeds and screenshots are expected to look better now! The new author card below every story: This new card is expected to give authors more exposure. 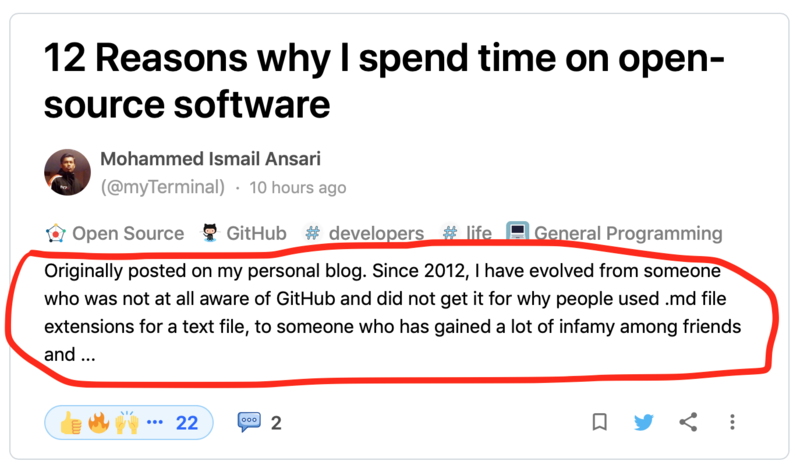 Show off your Twitter and GitHub profiles and get more followers. And many other misc UX changes which you will notice in various areas if you are an active Hashnoder. As always, we are very eager to hear your feedback on this Design Refresh. I can't overstate how much I appreciate the new design, in particular the pointed emphasis on readability and reduced eye strain. For many years now, and I'm not certain why, I've had such difficulty working my way through articles online that I tend to rely on TTS programs such as the native offering in Mac OS or the Speechify extension for Chrome. Unfortunately, I find that these can be rather embarrassing to use in public as they've brought questions like "are you dyslexic?" -- Nothing wrong with that, just feels a touch uncomfortable since I'm not really sure myself. One that really stuck: "You don't know how to read?" I can read; it just depends. Anyway, something about the design on this particular page--thinking largely it's the reduced width--made it so I felt no need for those crutches, and that is not a common thing for me. Really nice work and excellent design principles. Kudos for days, truly. Hello, I loved the UI. That's nice. You need to update site tour page. It's outdated. This is really cool and it make me feel there is large space available in new feed section. I see some profile section(post, stories, series) alignment issue in dark mode also. Hope it will be fixed soon. Love this overall design. Thanks, Dhanushka. We are upgrading profiles and tag pages next. Hashnode’s already excellent design is now even better. Thanks for providing such a tremendous resource.